After a week of various Family mass group ceremonies beginning with Palm Sunday through Holy Thursday and Good Friday, our Easter celebration came to an end with a lovely vibrant Easter Sunday Mass celebrating Christ’s resurrection. The children as always were at their best as they led us in prayer through words actions and song. They all began by processing into church waving their ribbons with enthusiasm, while singing with the choir led by Elizabeth ‘This is the Day.’ Fr Joe welcomed everyone to our celebration and Ellen and Miriam introduced our Mass for us. Orla, Jamie and Eoghan acted out a wonderful, simple and fruitful dramatisation of the bible story of what happened on Easter morning. This helped us to focus and listen to the Word of God and reminded us as Pope St. John Paul II proclaimed, “We are an Easter people, and alleluia is our song!” During our prayers of the faithful we prayed for those in need and that Jesus would be our friend. Our Mass concluded with Fr Joe getting a lovely Easter Egg as we all know he loves chocolate! and a blessing. As we continue our Lenten journey, we took time to-day to think about how great God’s love is for us. We were reminded in our Gospel story today that because God loves us so much he sent his son Jesus to be a light for us. Jesus shows us how to live and how to love. During this week we will remember to love God in return by being kind and loving to others. Jesus, you are a light to the world. You want us to stay close to you and follow your way. Help us during our Lenten Journey to be loving and kind. always saying please and thank you. God made the world and I will be thankful to him. to talk to God every day, knowing that he will listen to me. Because we know he listens to us. Today the first Sunday of Lent, we listened to the gospel story of how Jesus spent forty days in the desert alone and how he prayed to God the Father to help him. We also took the time to reflect on how we can, as the Family of God, spend our Lent this year. Ellen clearly and simply explained that this Lent as part of the Family mass’s Lenten journey, that each Sunday of Lent after the 10.3a.m. the children will be invited to take a thought for the week home with them. These thoughts will reflect a variety of themes for the children to explore during Lent, including: love, forgiveness, respect, thanksgiving and prayer. Today they also received a laminated sheet for them to place each thought on. 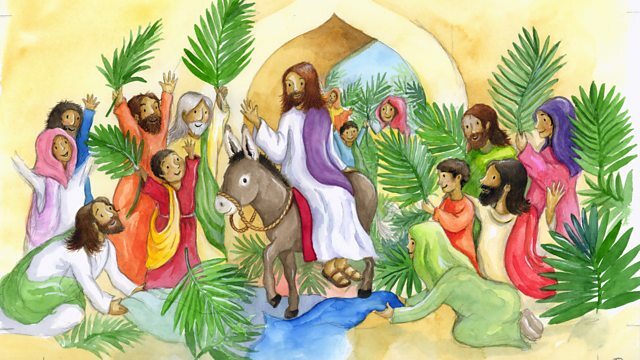 On Holy Thursday, the children will be asked to bring back their completed sheet with all their Lenten efforts recorded. This week we have been asked to remember to say sorry if we hurt someone or maybe to forgive someone who hurts us and to remember to say sorry to God. Like Jesus in today’s Gospel story we pray to God our Father and ask him to help us to do our best this week and remember to say ‘sorry’ and to ‘forgive’.